Ooooh I have been trying to catch up with myself this week and I got right behind, mainly because at last I am in negotiations for some work next term. Having not been in paid work since the end of March, I am really quite excited. I'll tell you more once it has been organised. This is a scheduled post as I should be at LB Crafts today with my sister where Lin has a workshop on making a frame and small canvasses. Also my Stamp Man teamie, Sue should be there as well - so we will get to meet - looking forward to seeing you Sue. So on to business. At the Stamp Man it is my turn to host and my challenge is to use alcohol inks. 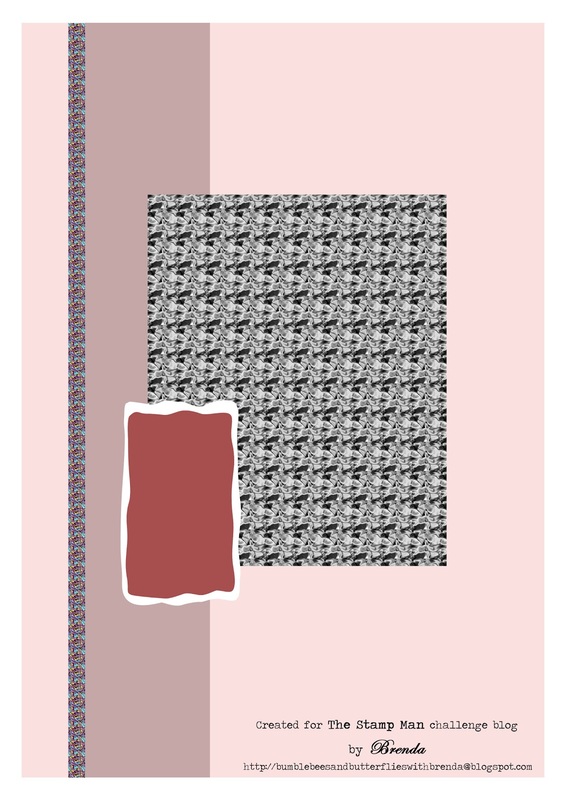 I have also provided an optional sketch for those who would like it, but it's not compulsory. Sadly the Stamp Man store is closing but Jill is staying on-line and continuing with her internet sales - yay, thank goodness for that. There are sales items that are very good value - so go take a look. 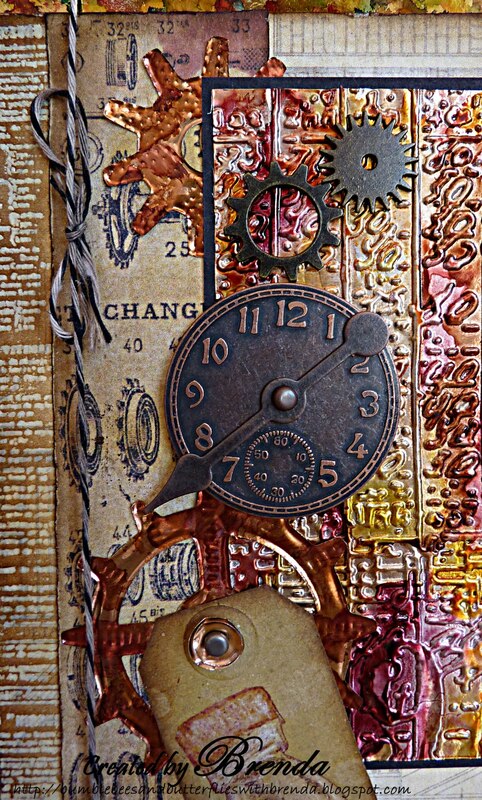 I have decided to use a steampunk theme this week, mainly because I wanted to enter the Just for Fun challenge but knew I wouldn't have time, but their steampunk work inspired me. So you can imagine I was pleasantly surprised to see yesterday they have an 'Anything Goes' challenge this week, so I can still enter this. I have also used the sketch, which has been kept very simple on purpose so that it can be embellished in any way you like. Adirondack alcohol inks are the inspiration of the great Tim Holtz - check out his blog and this video to see how to use them and for more inspiration. Stamp edges of paper and clear emboss - ink over. Run metal sheet through embossing folder and use alcohol inks and TH dabber to cover. Blend DI and then AIs and blending solution over paper strip. 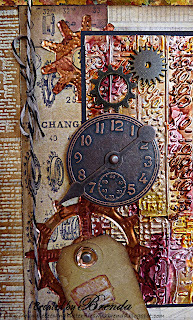 Die cut gears from metal, texturise and again alcohol ink over them. Stamp small tag, blend with DI, sprinkle with water, heat dry and colour with drawing pencils. Edge piece of gold card with AIs. Create wording in Word, distress with DIs and AIs, glue on. Colour the bakers twinr with walnut stain DI. Distress edges, mount pieces and add metal embellishments. You can see the alcohol inks on the gold card here which edges the whole piece. Grungy Monday - Alcohol Inks. If I haven't got to see you recently hopefully I will get to catch up with you sometime over the weekend, but I am also off to the Stamp Show at Newbury tomorrow. Maybe I will see you there? Take care and hopefully you have got some lovely things planned for the weekend. Wow Brenda - this is fabulous! Love the effect of the alcohol ink on the embossed metal panel - the colours are glorious. Only just found this Brenda and it's absolutely stunning. Really lovely the alcohol inked panel and all the steampunk style embellies. OOOh Brenda, another WOW!! This is a real stunner. I missed this one earlier...how could that be? It's fantastic! I'm going to have to see about that metal. With the embossing and the alsohol inks, it's amazing. Thanks for your comment today...you are so funny! As if I'm waiting for winter..ha ha never!! How fantastic, I'm missing words, really wonderful pieces. 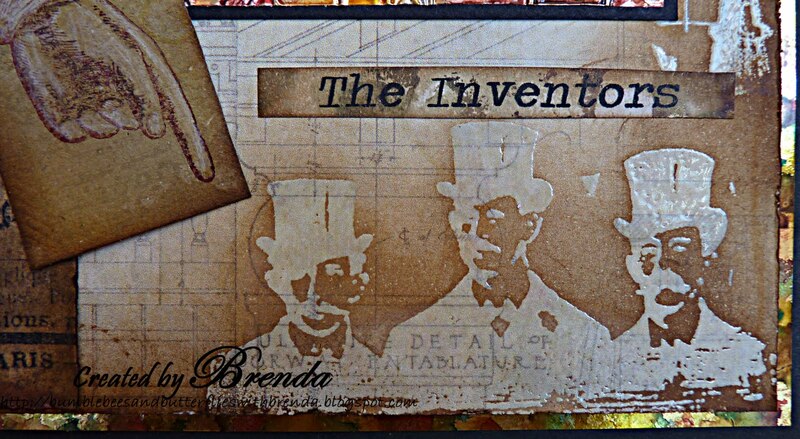 Fabulous card Brenda ! The metal looks stunning ! Really lovely to see you yesterday. It took us 2 hours to do a 1hr 20 mins trip, but the day was worth it ! I didn't say in the class, but I did love the green you chose, so looking forward to seeing it on your blog. when I saw this on the DT post I knew I had to come and have a close look at how you created it, it is just stunning. I love the embossed metal, the colours are amazing but it was those three men that really caught my eye. I can see now you white embossed them, they look great. You've created so much depth with it all, it's a great theme and I love the sketch. Wow, these are fantastic, love the details. What glorious work, stunning colours and the metal looks amazing. This is awesome! 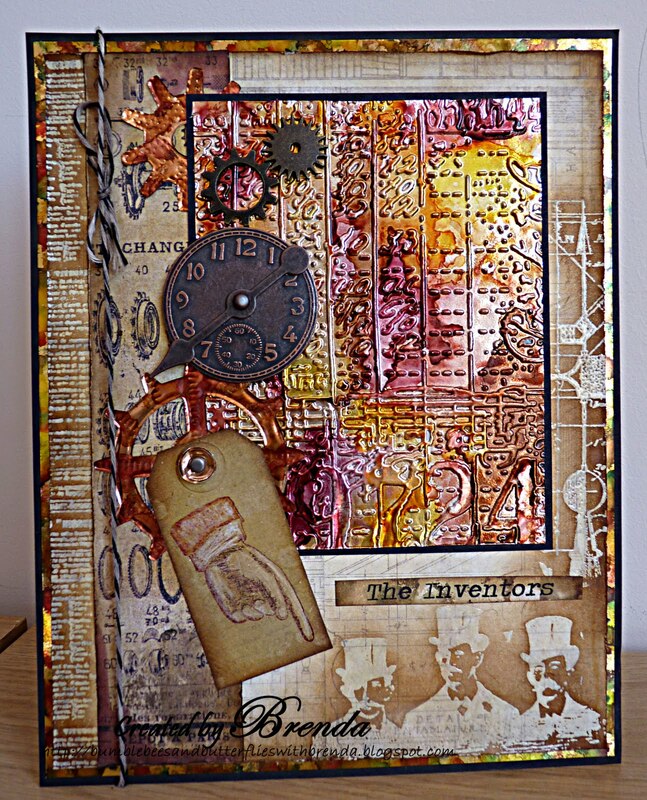 Love the effect using clear embossing with those stamps, really spectacular! Thanks for joining the Simon Says Stamp and Show Challenge! Fabulous composition and colours - love all the textures and layering and the three men look just great. Am lovin' this - a lot! Must remember the colour combo of AI's you have used as I think they are fabulous on the metal. So glad you managed to show us this despite being late for my Steampunk challenge. I just love everything about this and you should be very proud of it. Amazing piece of work Brenda!! WOW! This is a masterpiece! braco for the composition, the work with the alcohol inks and I particularly like the clear embossed stamps! great job with this challenge!